Launching A New Page! Stitch Meditation and more! Just launched a new page right here on my website dedicated to all things STITCH MEDITATION, SLOW STITCHING and some EMBROIDERY LINKS. 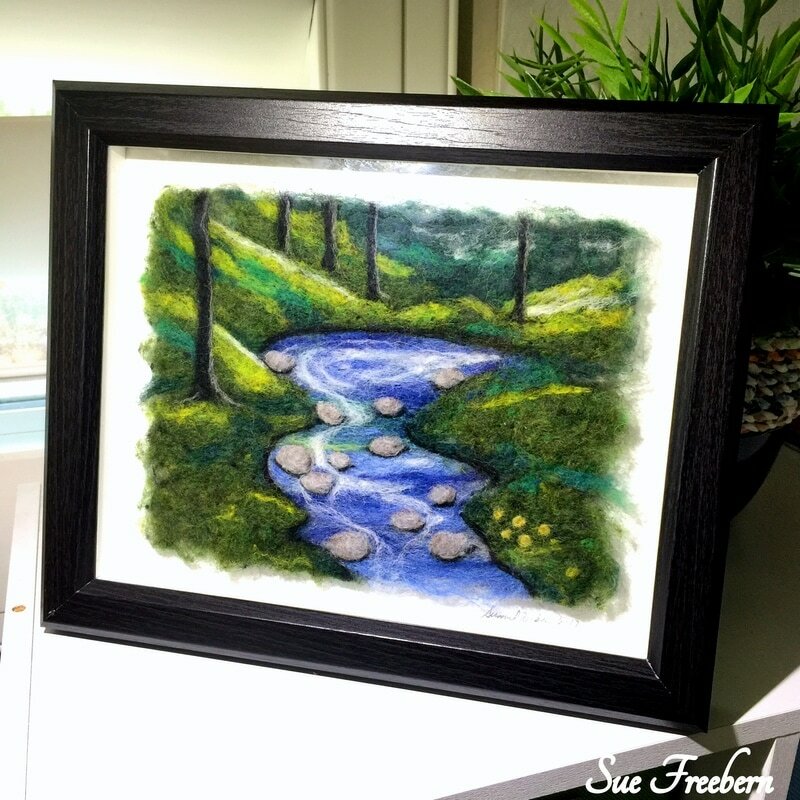 Now you can find all the links, photos and videos that I have posted on my FACEBOOK artist page, Sue Freebern Designs and others I have found in one spot! No more looking and digging for them when needed for inspiration! YAY! Hope you enjoy it. 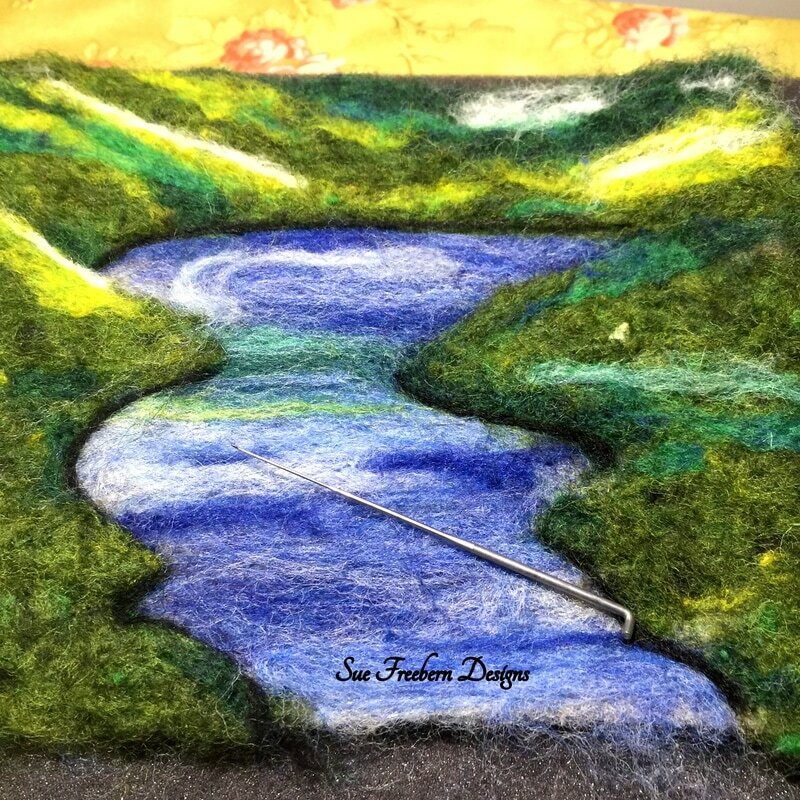 Click here or go to the top of my website to the page named STITCH MEDITATION/SLOW STITCHING! Stitch Meditation- recycled linens with selvedge edges and different threads! FUN! 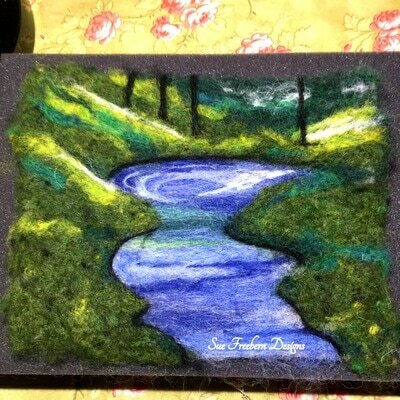 Inspiration, Stitch Meditation and Trees! 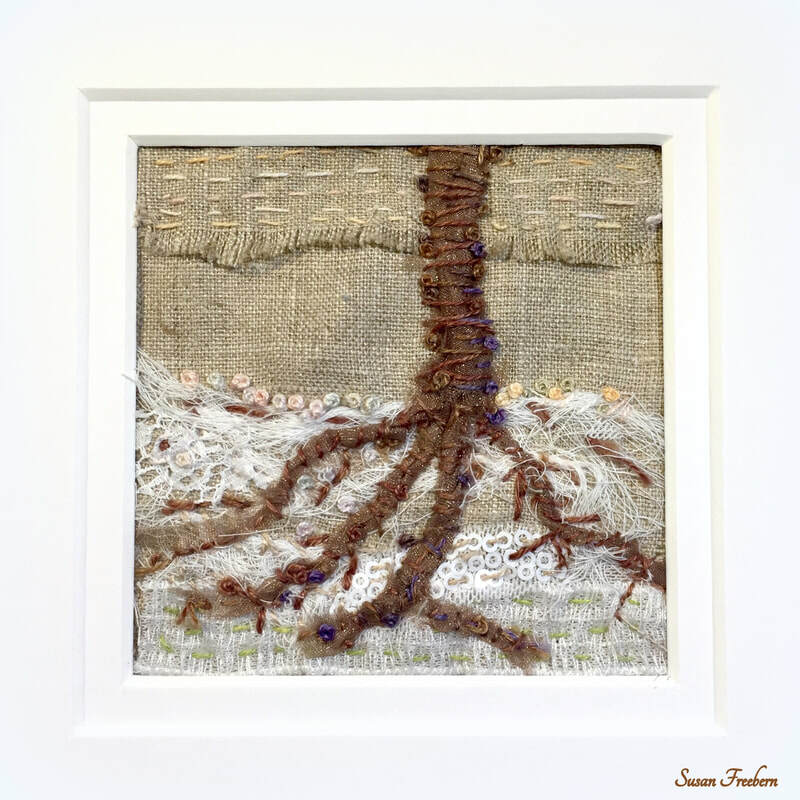 Inspired by Liz Kettle's video on STITCH MEDITATION and a BBC documentary by Judi Dench on her love for trees, I picked up some linen and decided to just add random fabrics together that I love and just stitch away. 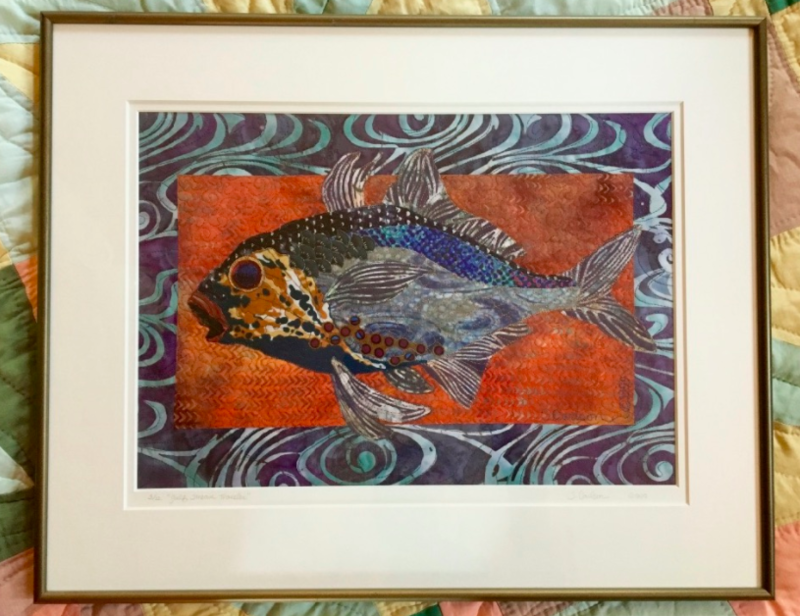 I have always wanted to add texture in my work and flat machine stitching on batiks and cottons just wasn't doing it for me. I love hand stitching but my arthritis has always stopped me in the past. The pain the next morning was sometimes unbearable. But this time I was determined to sew by hand. I thought about what it was that hurt them....hmmm...it was the pushing and pulling through the fabrics! AH HA! Linen is a lovely soft and open weave fabric so I grabbed a neutral colored piece and it worked! I added other very textured but loose fabrics like nylon and rayon and I enjoyed it so. I had no plans as I went along. I found a sheer that was brown and I wrapped and rolled. Hey it looked like roots! COOL! Hmmm. I was loving this. Then I decided to wrap the thread around the sheer to give it a more textured 3D look. Loved that too. So on I went. Each night before I would go to sleep I turned off the TV and sat and stitched. Not too long but long enough. I knew when I was done each night. It was my stitch meditation! Calm and relaxing.I look forward to it each evening and sometimes maybe in the day. I am auditioning this one with the 2 mats with the 4" opening. I think it works. Maybe you are inspired like I was? What makes you inspired? I love trees and hope to do a series of these soon. NOTE: Click on STITCH MEDITATION (blue text) to go to that video. It looks like Judi Dench's video My Passion For Trees was taken off YOU TUBE. ENJOY! 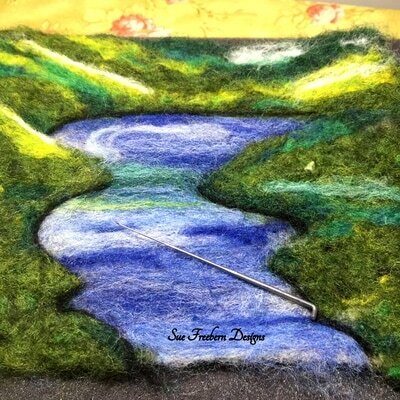 Susan Carlson wrote a lovely blog post on ways to finish up your art quilt. Wrap it on canvas, hang it or frame it. Love seeing her work and getting her tips. I just added this to my page called BINDING/FINISHING so you can always some access it there along with all the other links I have for you. 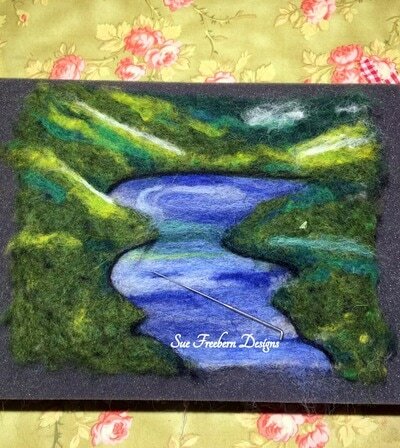 CLICK on the photo above to go to the page or on the words BINDING/FINISHING here or on the top of the page. Enjoy! 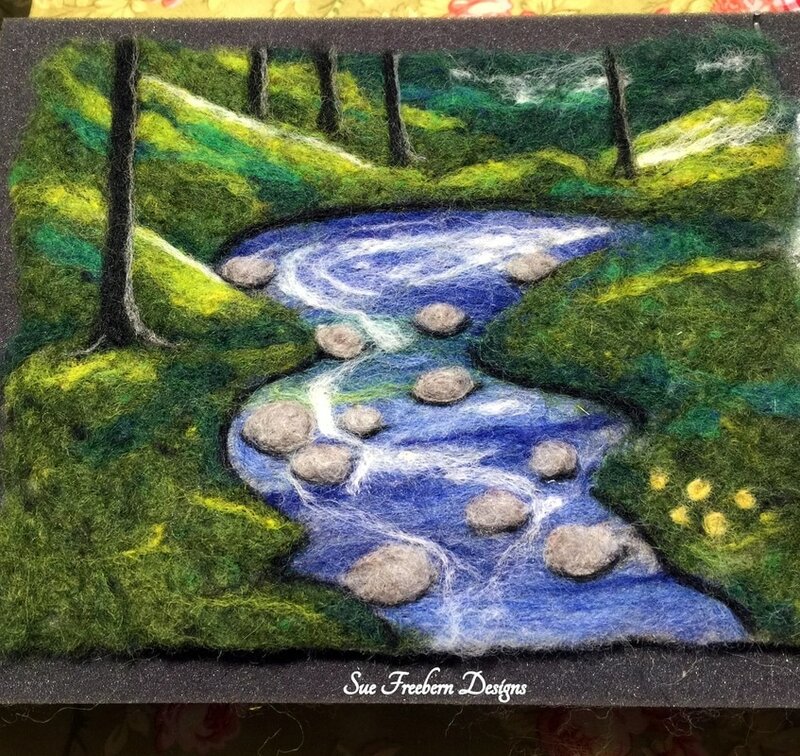 Well I am very happy I tried needle felting and I really loved the process! You can see some of the process in my photos. 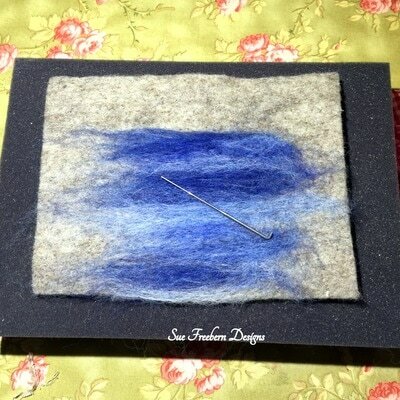 This was all inspired by Felted Sky on YOU TUBE and I got her kits and made it my own. Now I love it. I am always wondering how to get more texture into my art pieces! Now I know one new technique! I decided to put my piece in an 8" x 10" shadowbox type frame and leave the edges out because the one reason I was drawn to this method was for all the texture it gives. If it's all behind the matt I lose that feeling. For me it works. I will probably learn a lot more about this wonderful world of wool needle felting and may just add to this as I learn. But now I get to enjoy it...:) Happy! 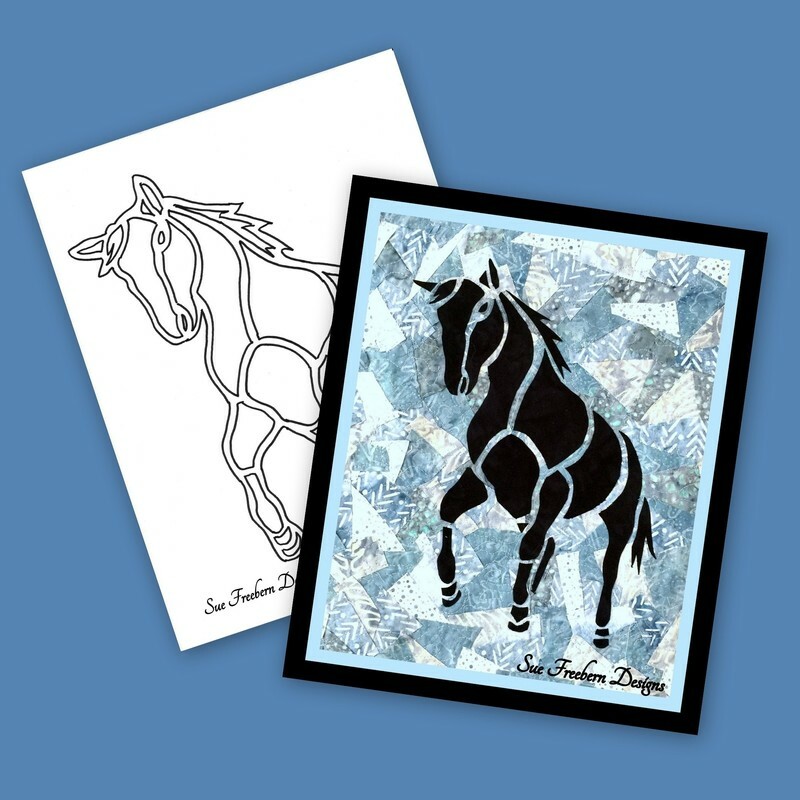 My Wild Horse Silhouette template (only) is now available on Craftsy and Etsy! On this art quilt I used a confetti style/snippets background and did not use the light silhouette outline behind the design. I wanted to try something different! It was so fun to make. Just cut and glue or fuse then add the individual pieces! (I still provided the silhouette outline on the template like all my other patterns and templates available!) I just have not had time to write up the newer directions to this but I will. I did want to make the TEMPLATE ONLY available to you now though. If you have made any of my patterns you will know exactly how to make this new one! Maybe you want to try something totally different! 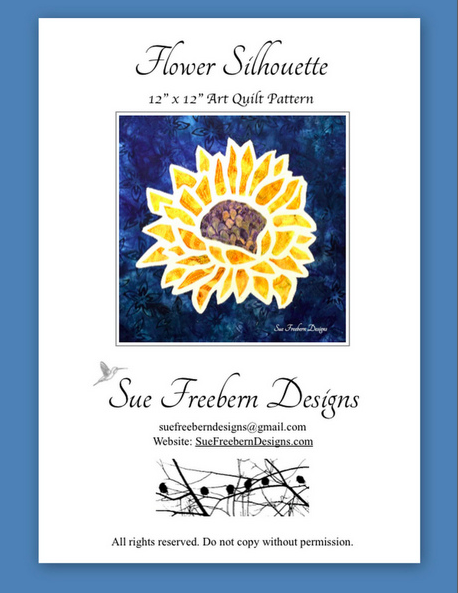 We would love to see it in our group Sue Freebern Designs: Show & Tell on Facebook! Thanks again! Click on CRAFTSY or ETSY to go to the listing! ENJOY! Flower Silhouette Pattern 12" x 12"
My Flower Silhouette full pattern with directions or just the template by itself are now available in my Craftsy, Etsy and eBay shops. Instant downloads and hard copies are available. With this one I used 3 colors instead of 2 as seen in my earlier patterns. I also used scraps of fabrics and fussy cut the petals one at a time! So fun! Click on the links to my shops for more. ENJOY! TEMPLATES to Patterns Now Available! Silhouette TEMPLATES ONLY now available! 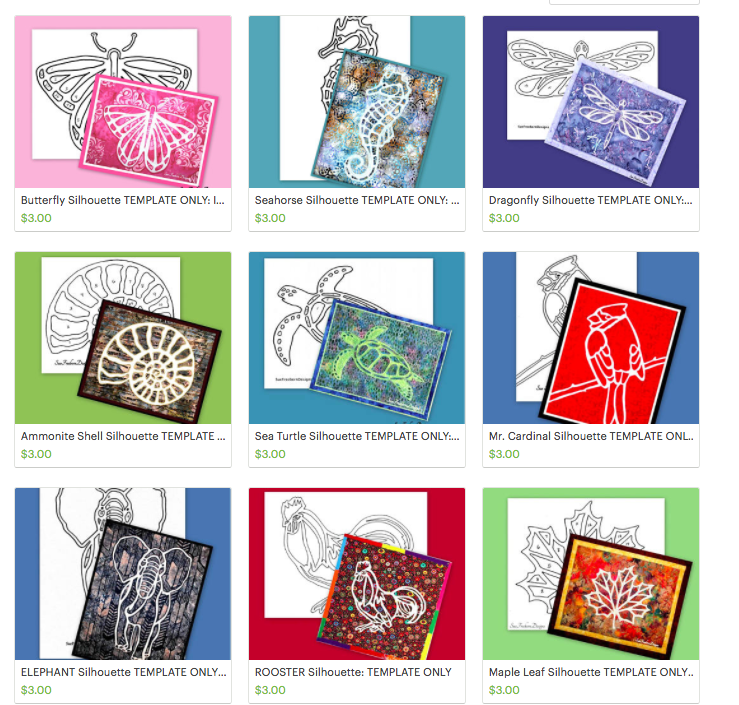 I've been busy listing my art quilt TEMPLATES on Craftsy and ETSY today! They are all now available to get at only $3.00. No instructions are included. Many times all you need is a template to be inspired to create your own work of art no matter what it is! 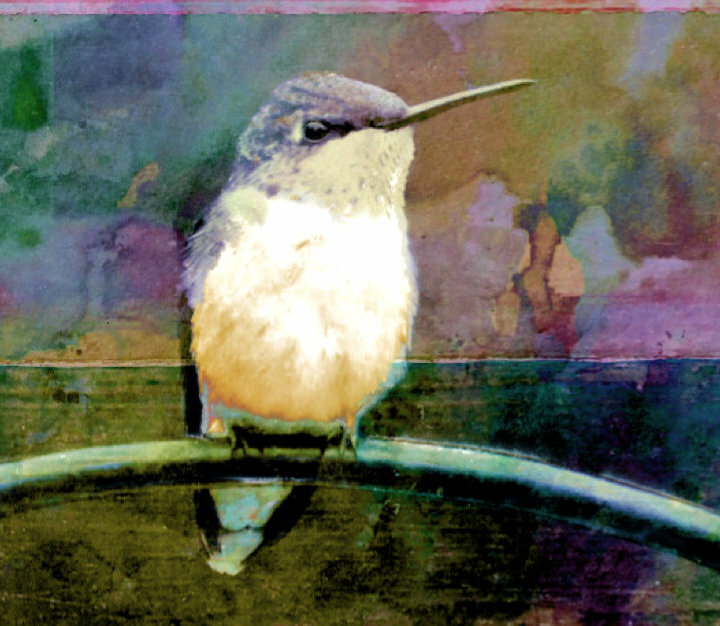 Art quilts collage, woodworking, paintings, stencils and more! Available now! See the right hand side or HOME page for links to the shops! EASY! Instant downloads! If you need a hard copy just email me for info. Mr. Cardinal Silhouette Pattern is here! Scrappy Bindings: Now I love to Bind!